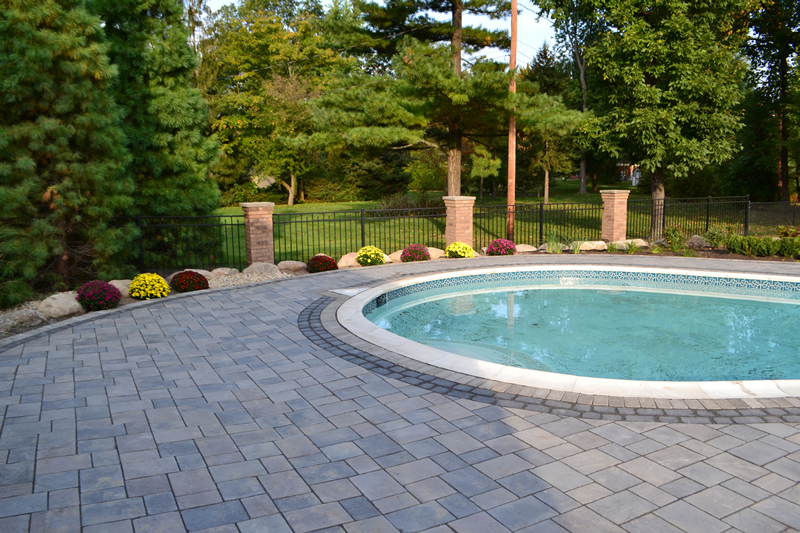 This pool yard in Macomb County was in need of a complete renovation. 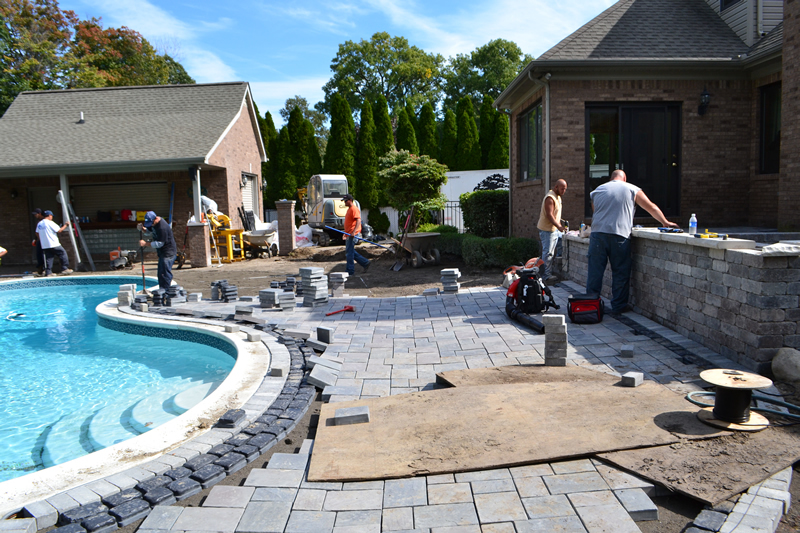 In the initial meeting with the clients, we found out that they wanted to transform their backyard into the ultimate entertainment space. 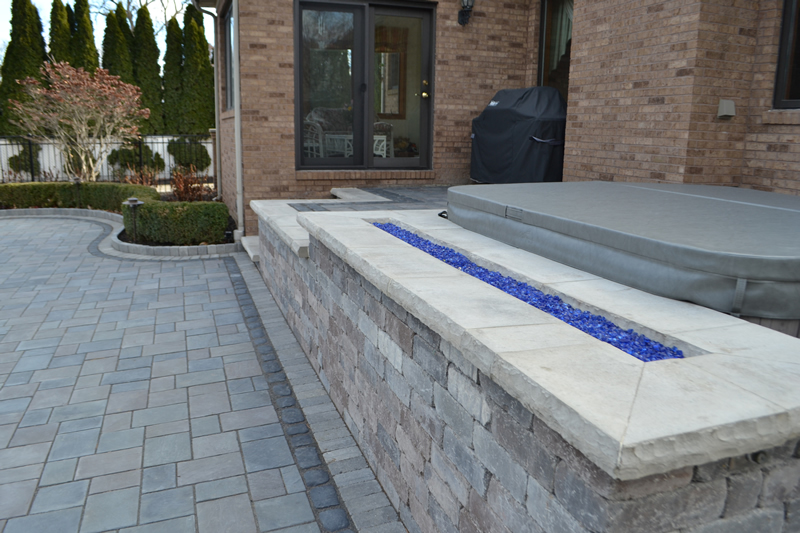 They wanted to redo the old walkout porch and incorporate a built-in hot tub, enlarge the swimming pool deck to accommodate more people, and they really wanted to use a fire accent in the new landscape design. 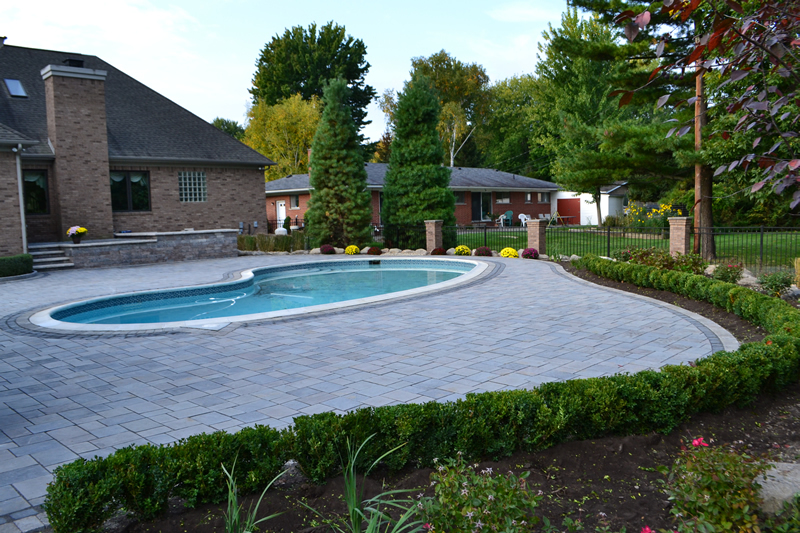 Our team then put some ideas together on our 3D Landscape Design program, after a few changes and a revision we had a concept that they were very excited to see come to life. 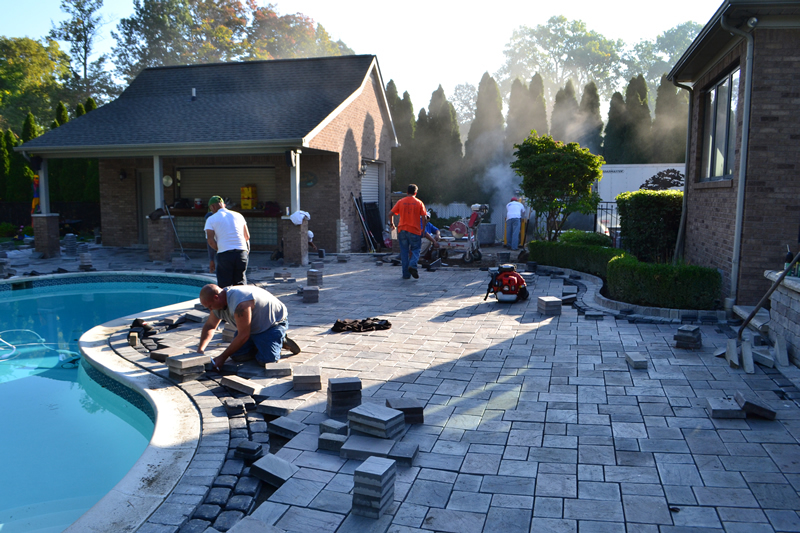 It all started with the tear out of everything except the gunite swimming pool. 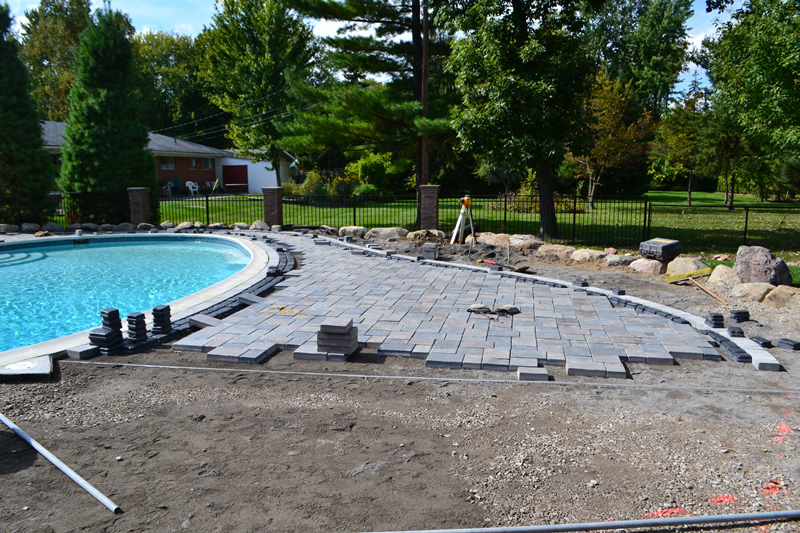 We removed all the old brick pavers, the block porch, and all the concrete around the swimming pool. 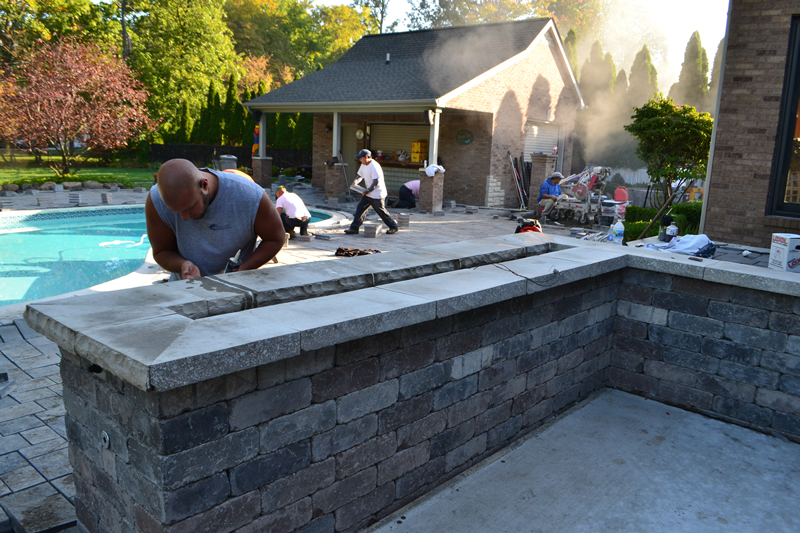 The first step was to create the elevated porch area and the enclosed hot tub walls. 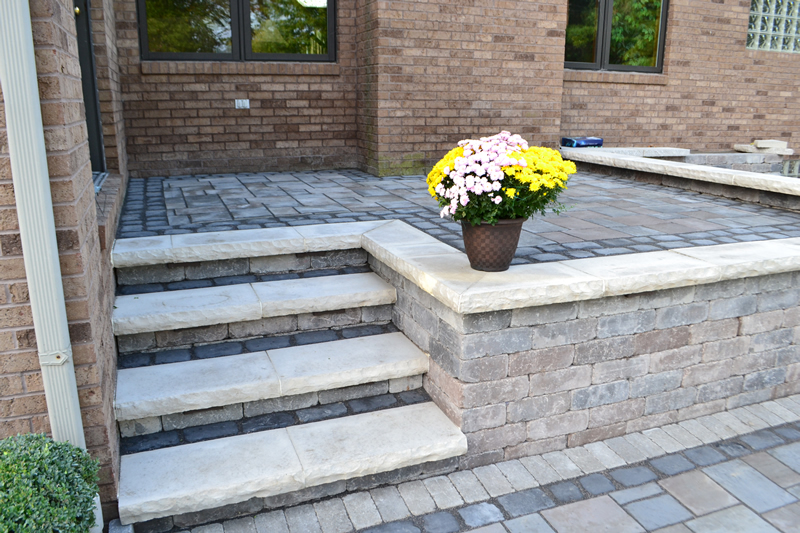 We constructed the entire elevated porch and hot tub area of Unilock Brussels Dimensional block and capped it all with premium Unilock Ledgestone Coping. 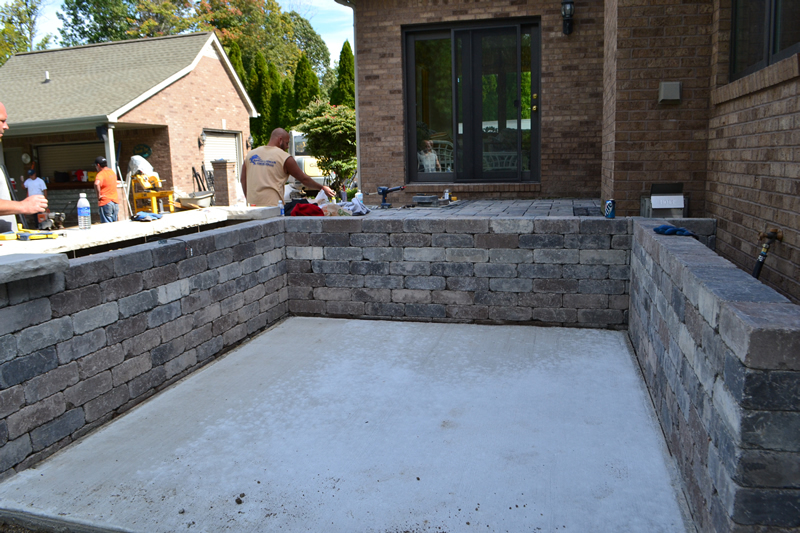 We poured a concrete pad for the hot tub to sit on inside the block walls and then incorporated an 8’ Fire Wall inside the hot tub enclosure. 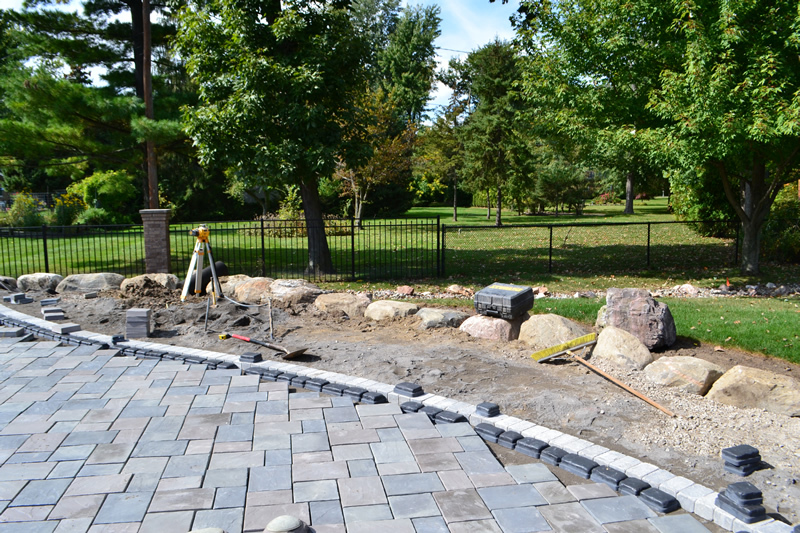 The next step was to start excavating for the brick paver pool deck. 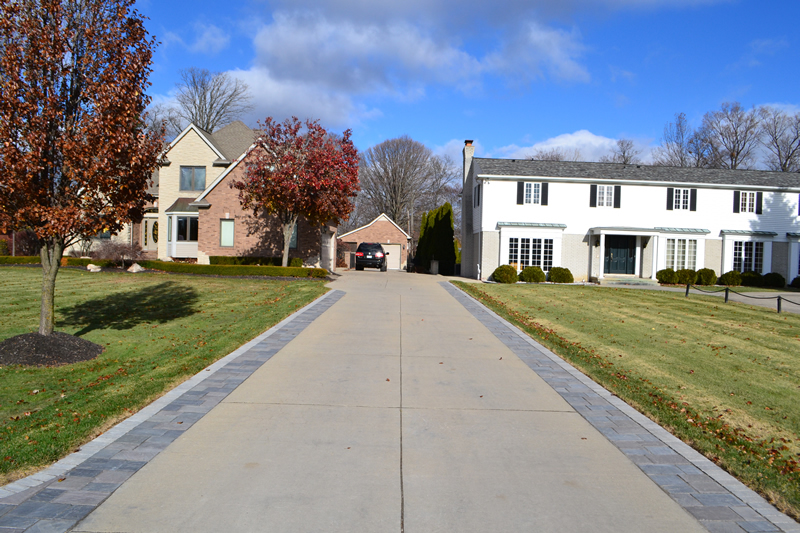 We removed approximately 10” of subsoil and old paver base, then we filled the area with 9” of compacted 21aa Limestone. 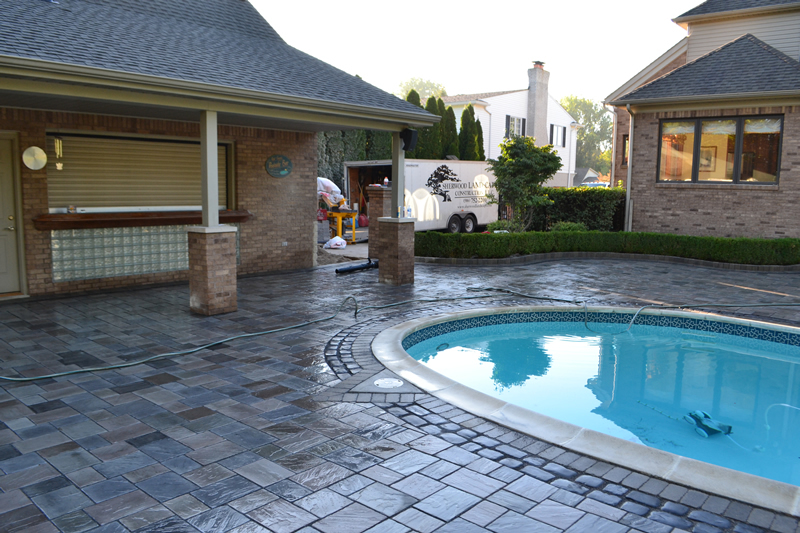 Drainage in this swimming pool yard has been an issue for the clients for many years. 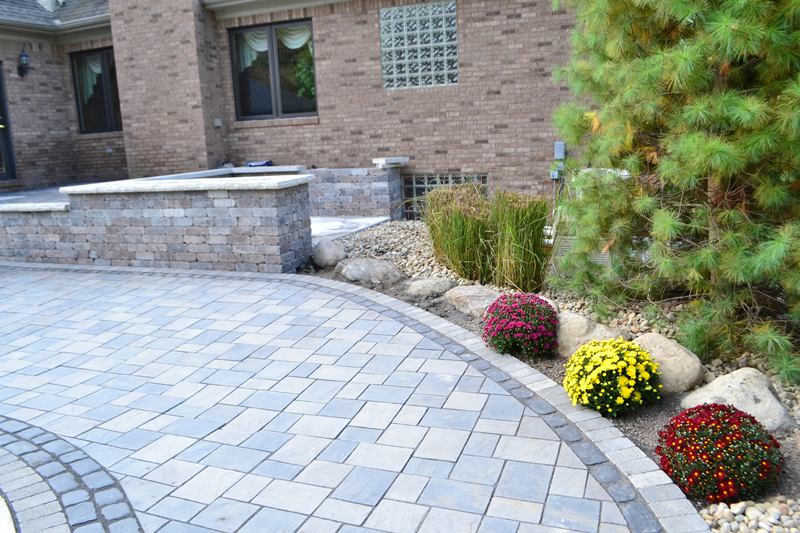 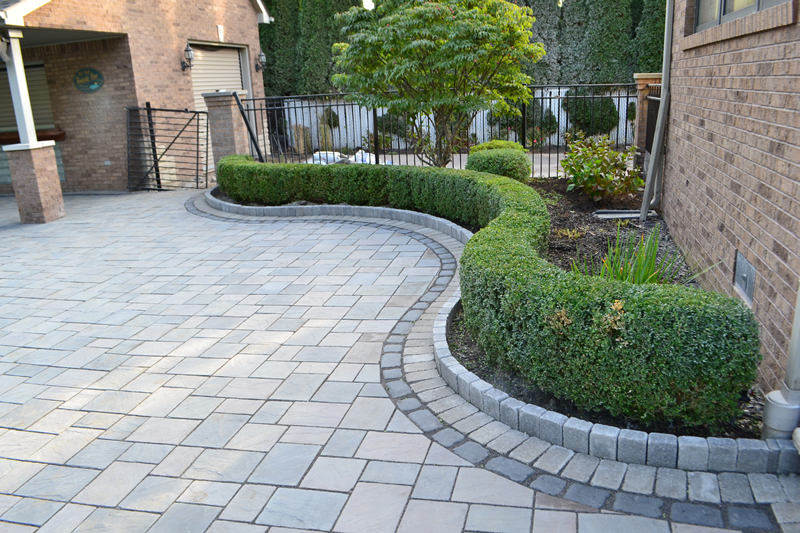 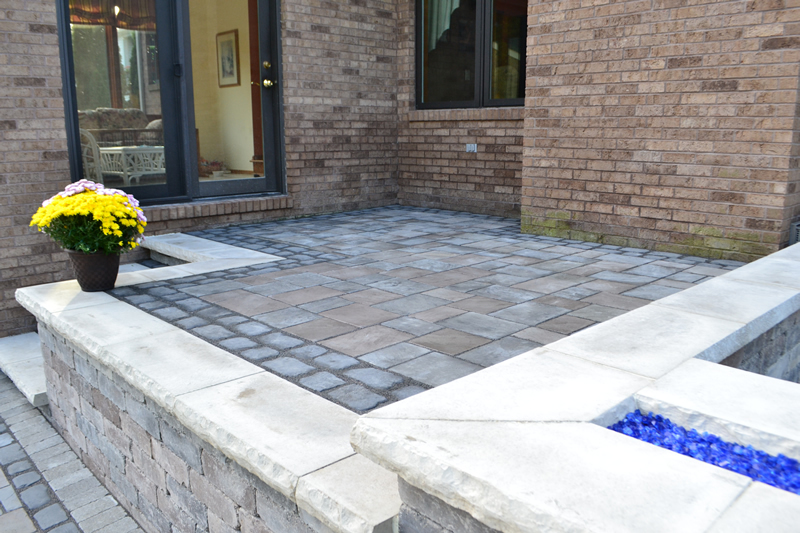 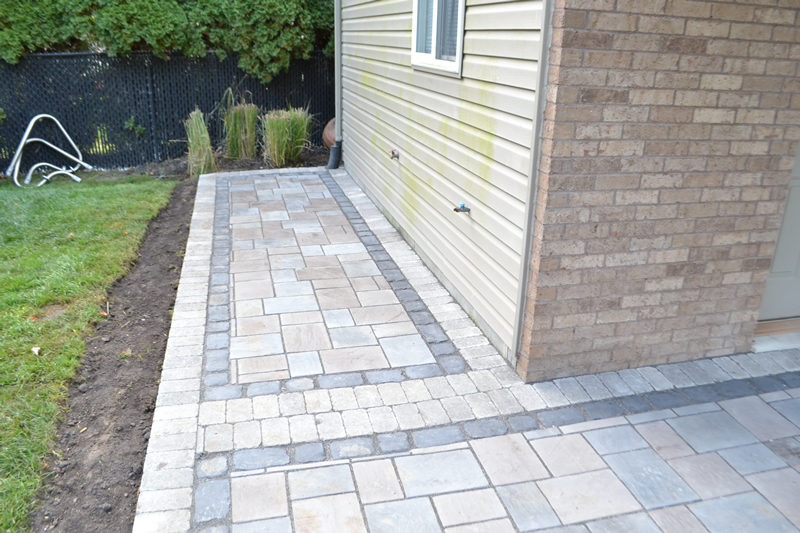 Our experienced brick paver installers created subtle swales in the paver base material to allow water to drain off the surface without the use of an unsightly, problematic channel drain system. 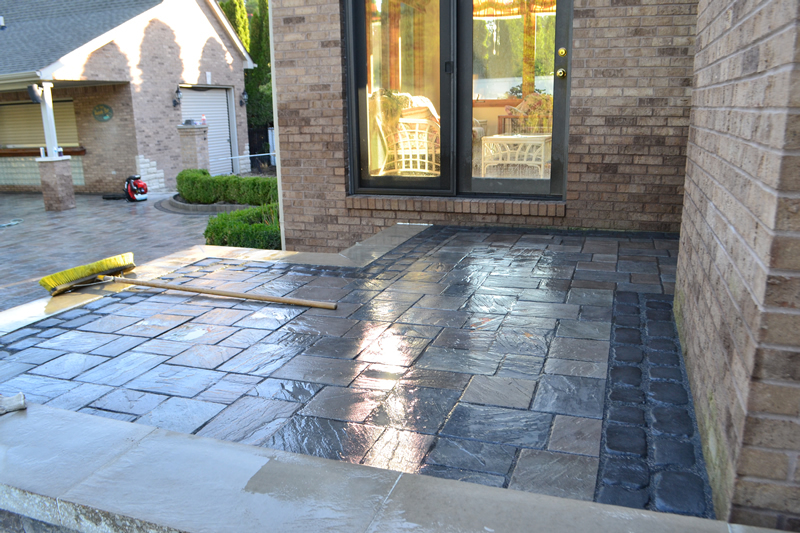 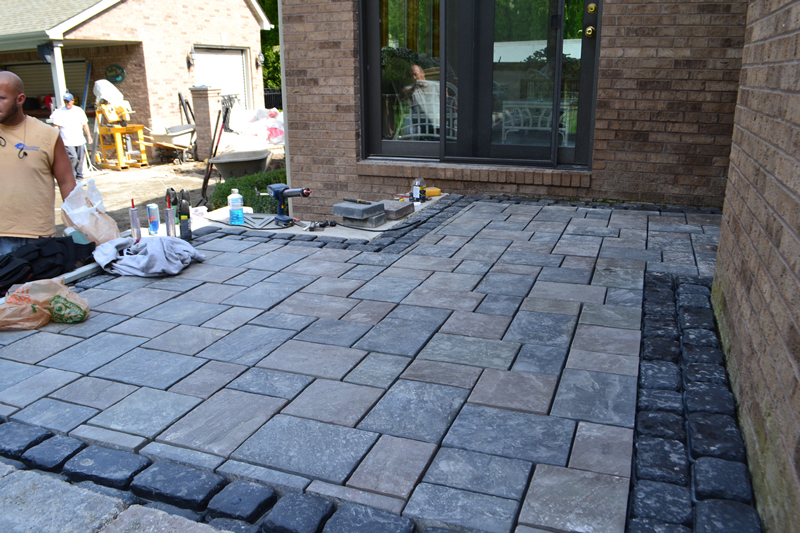 Then comes the task of laying all the Unilock Brick Pavers and creating a work of art. 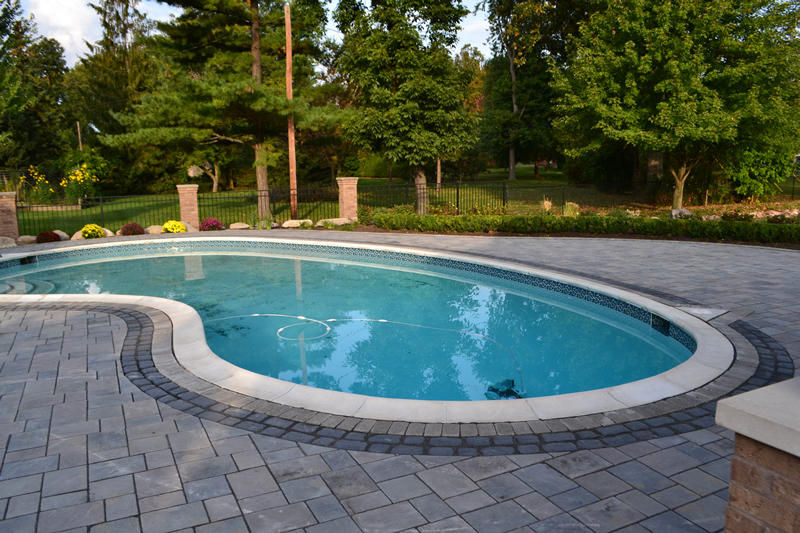 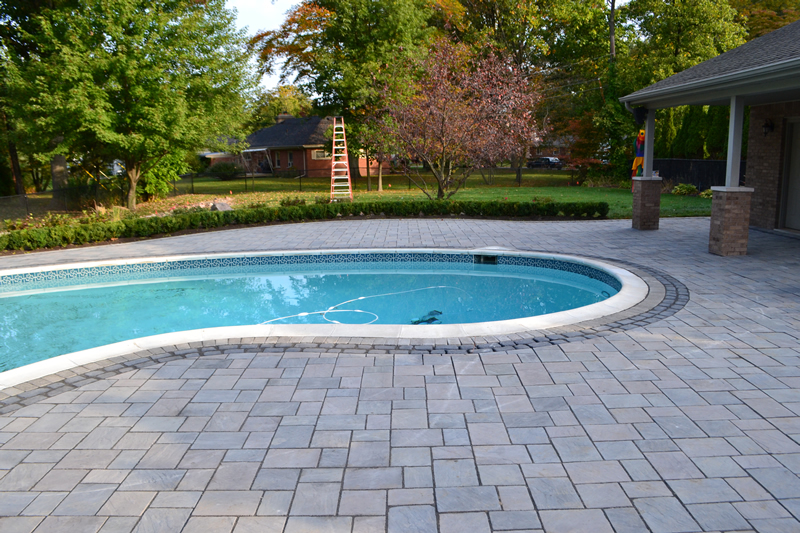 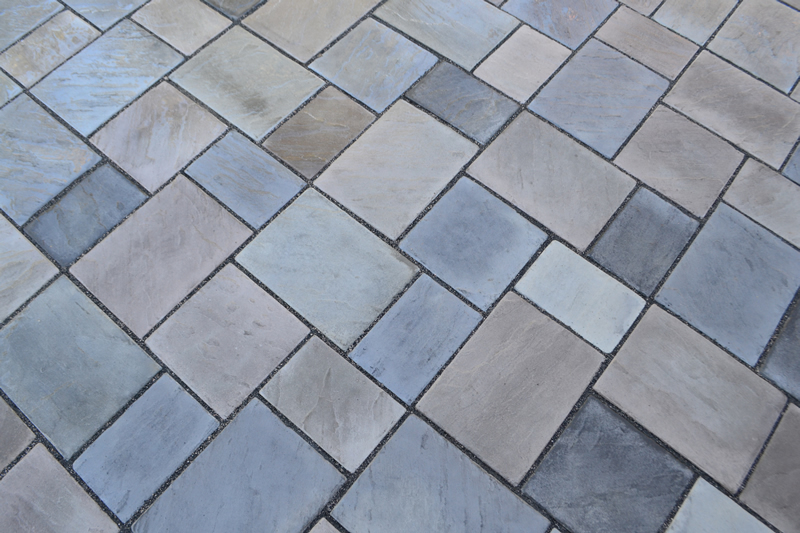 The clients picked a paver field of Unilock Richcliff Brick Pavers with a mix of the colors “Pebble Taupe” and “Dawn Mist”, and an accent band of Unilock Courtstone in the color “Basalt” to really set this pool yard off. 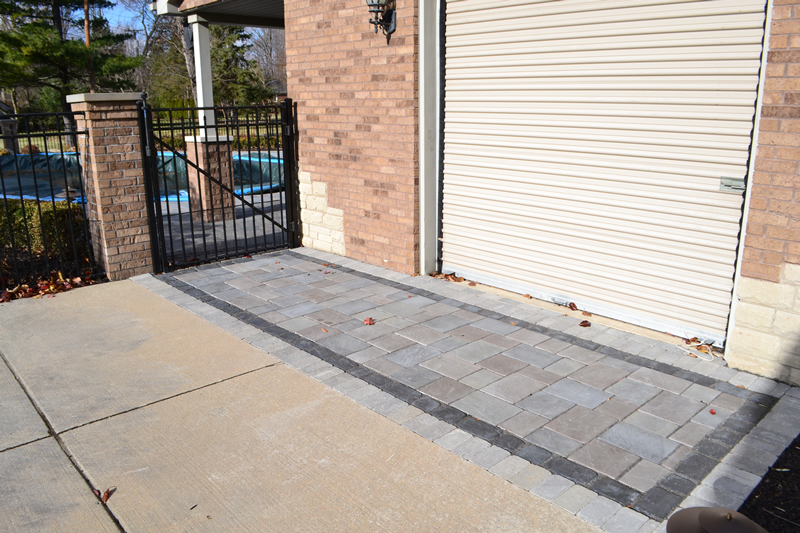 When all the Unilock Brick Pavers were installed and cut in we locked it all together with premium black polymeric jointing sand. 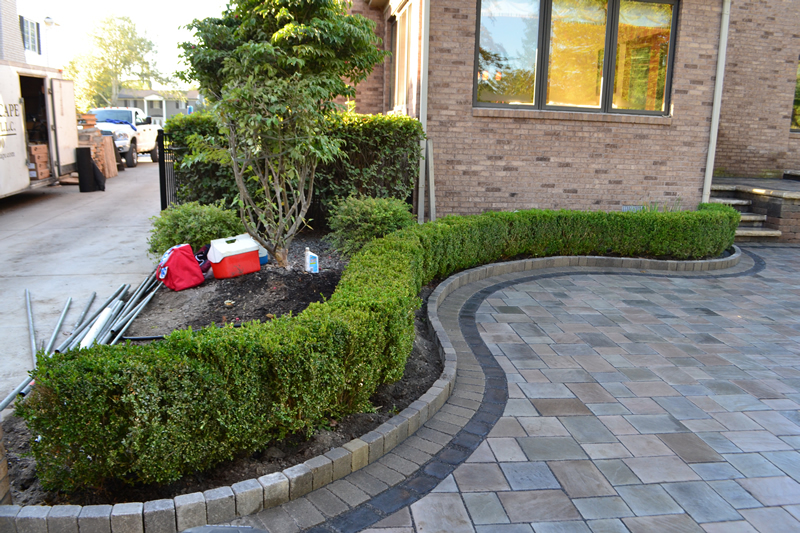 To soften the addition of all the hardscape around this pool we added a boxwood hedge along the edge of the pavers along with some knock-out roses and twist & shout hydrangeas for some pockets of color to brighten the area. 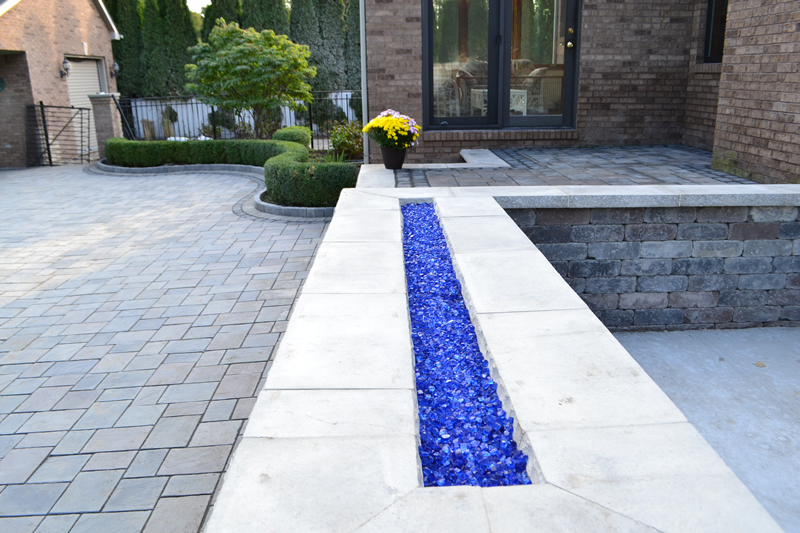 In the end, the homeowners were ecstatic with the finished product and couldn’t wait to put it to use. 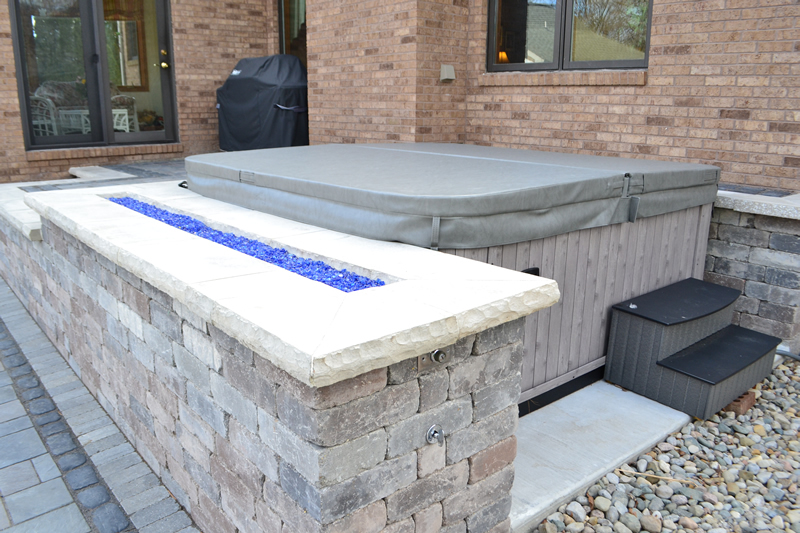 This backyard retreat has plenty of room for friends and family to swim or hang out at the cabana bar or the option for the homeowners to simply relax in the hot tub next to the firewall with a glass of wine under the summer stars. 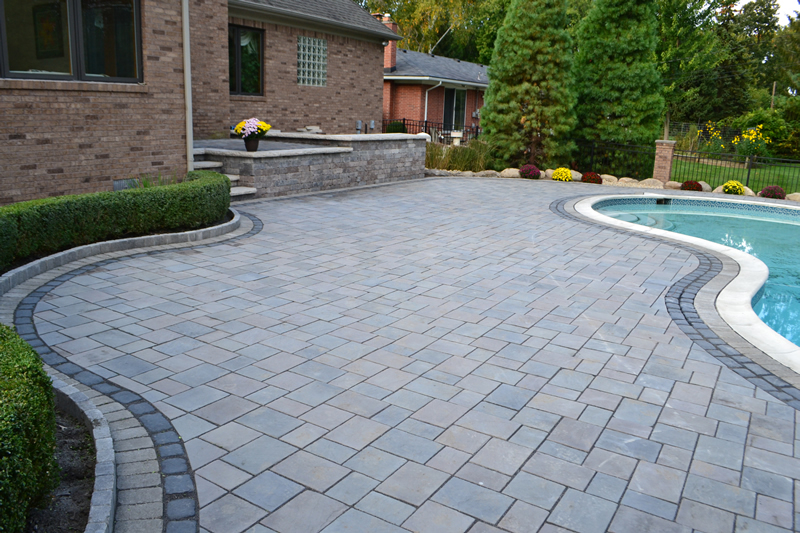 This backyard has all the elements of an outdoor oasis and all the premium construction practices to last the test of time. 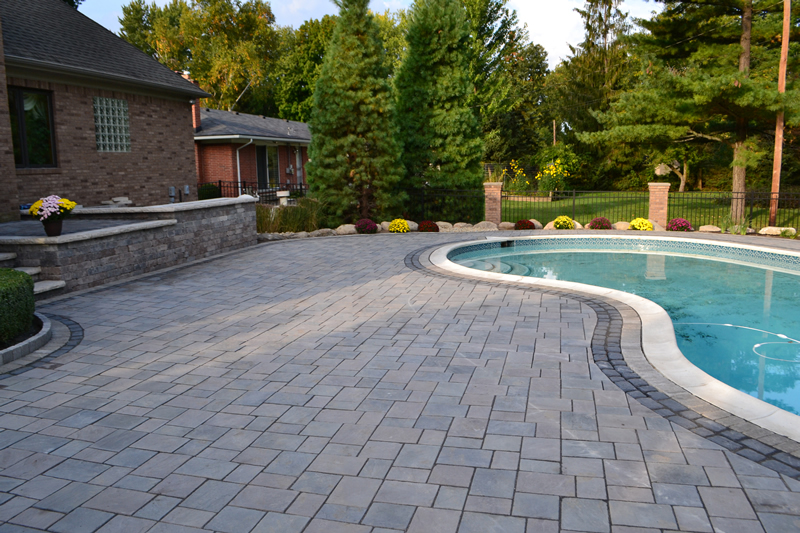 Call Sherwood Landscape Construction to see how we can transform your backyard into your favorite place to vacation.